# Pour 1 cup of water in a wide bowl. # Add yeast and sugar on it, mix by your finger tips. # Add the sifted flour on it. # Add the rest of the water, salt, and the flour slowly while kneading. # After adding all the ingredients knead for 5 minutes too, close the dough with a dewy fabric, and let the dough stand for 1 hour. 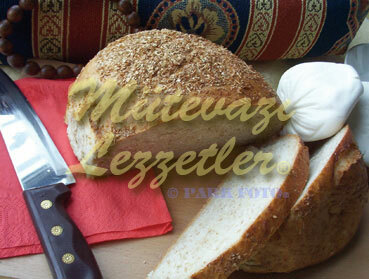 # At the end of the time cut the dough into 2-3 pieces, shape out as bread. Sprinkle bran on it. # Place the bread dough pieces on the greased oven tray, let stand for half an hour. # Bake in 210 C (F 410) heated oven for 40 minutes. Note: brad of the flour which you sifted and added to the dough stand on the sieve. Sprinkle this brad on the dough in this way you don't need to buy extra brad.